Pignic (Hardcover) | Let's Play Books! It’s a perfect day for a pignic! A blue sky. A shady tree. A bright kite. And a full picnic basket. Four little pigs and their parents head outside to enjoy a beautiful day. With a little help from some new (and unexpected) friends, they climb trees, fly kites, and enjoy a delicious picnic. Even a sudden rain shower can’t ruin their fun. Because rain means . . . MUD! Hooray! 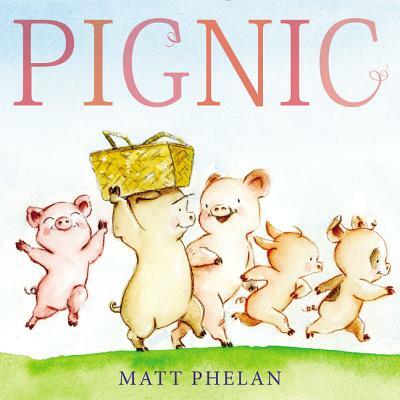 The award-winning and New York Times–bestselling Matt Phelan has created a timeless, must-have picture book for the youngest reader. Expressive watercolors; a simple, repetitive text; and gentle, satisfying twists will delight fans of Tad Hills’s Duck & Goose and Anna Dewdney’s Llama Llama books. “One line of text keeps things simple for young readers, but the story is also nicely unpredictable and satisfyingly dependent on the illustrations...watercolors make the sun, wind, rand, and mud feel tangible, and hoorays abound until the adorable, happily filthy little pigs return home at sunset.